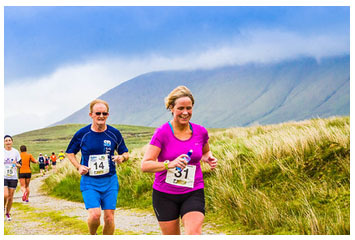 This race was advertised as the part of the Run the Kingdom series and because I am regular visitor to Castlegregory I was interested in taking part. Ita Kirwan and I travelled on Friday night and headed over to the quaint village of Camp to collect our numbers and line up for the race. I was nervous, (well I’m always a bit nervous at the start of a race) about what lay before because the elevation map was telling me I was going to climb almost 1000ft in five mile, with the pinch coming at 4-5 miles. We lined up, about 62 of us and headed off, almost immediately climbing. After about a mile we went off road, followed the Dingle way for a short period and then right onto another road. We climbed steadily for 3 miles, water at 3 miles with cheery stewards who had a cheery baby. From here you could see the climb (or so I thought), up the hill and around and another cheery steward or maybe she was feeling sorry for me because only then did I see the big MOUNTAIN. Once we were at 3 miles the scenery was breath-taking, the photos of the race give you a glimpse but it was open and you could see for miles. But back to the MOUNTAIN, I made a stab on approach and around the corner but the gradient just was too step for about roughly ½ KM. Almost everybody (except the winner) walked this part. The beauty of the landscape took away from the slog. I knew from the elevation map that at the top the worst of the climb was over and indeed it was, the initial descent was a bit steep and I was slow but then we were on good trails. 6 -7-8 was an out and back with a subtle descent and a subsequent ascent but I was feeling good at this point. Back out onto the Road and 2 miles of significant descent to the finish. There were Stewards at every junction, who were really encouraging but it was the scenery that was amazing. 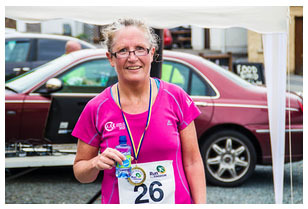 The finish was great, a DJ, a bbq and loads of sociable chat. Everyone got a t-shirt and medal and even better Ita was 1st lady. This race is not for everyone but everyone should try it at least once. The organisation is fantastic, the route is testing but fair and I’m not embarrassed to mention it again the scenery is just something else.